Any teams with a balance on entry fees are asked to pay as soon as possible. In order to speed up the registration process we would prefer not to take payments during registration. If it is unavoidable we can accept cheque or cash payments at that time, no credit card payments can be accepted. This years race course is very similar to the races in the past. The order of events this year will be trail running, mountain biking and sea kayaking. The approximate distances will be 15km of running, 40km biking and 10 km of sea kayaking. 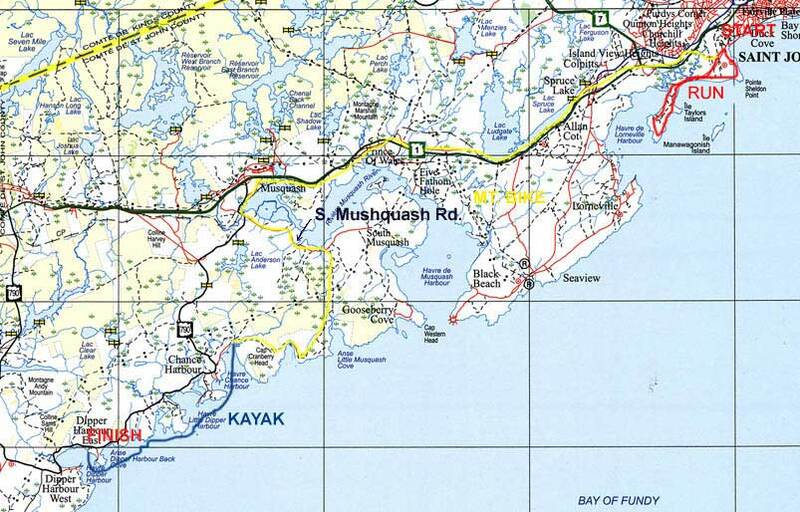 The start of the race will take place at the Irving Nature Park and finish in Dipper Harbour. 1:50 000 topo maps of the course at registration. Teams will be transported back to the Irving Nature Park via Bus after the race or race party. If you are with a friend or family they can drive your vehicle to Dipper Harbour and watch your finish and join us for the party. First Aid Kit – 1 tensor bandage, 1 roll of tape (athletic or duct), assorted band-aids. All paddling equipment will be provided (kayaks, skirts, paddles, safety equipment and PFD’s). You can bring your own paddles and PFD’s and they will be transported to the start of the kayak leg. Each team is allowed one small bag/pack for water and gear. We will transport it to the beginning of the kayak leg. The race will be divided into the following categories: Solo, 2-person co-ed, 2-person all male, 2-person all female and over 40. Prizes will be awarded to the top 2 teams in each division. We are still accepting registration for the following two events. Please sign up in advance or these may not be offered due to lack of interest. This short course will cover all the basics you need to feel comfortable and safe on the water. Learn correct paddling techniques, paddle strokes and a variety of rescues for both single and tandem kayaks. Includes certification for future adventure races. Evening social and lobster boil included. Thinking of getting into adventure racing, but not sure what it is all about? Do you just need some guidance with certain aspects of racing? This short course will be catered to what you want and include how to train, tips on map work and navigation, what adventure racers eat and any thing else you want to know. There is camping available in Dipper Harbour at no charge. However, please book in advance so we know how many people we will have. If you have any other concerns or questions please do not hesitate to call or e-mail us.